Late in 2007, Circle of Friends was adding hundreds of thousands of users a day, and Ephraim and I knew the time was right to expand our office beyond my kitchen table and raise some money. We each reached out to a few of our friends, and quickly got a number of introductions to angel investors and venture capitalists. My friend Jared introduced us to Mike Maples. Friends of Ephraim introduced us to Jeff Clavier and Naval Ravikant. Mike, Jeff, and Naval all wound up investing in our company. Immediately after signing on, and then for years after, each of them introduced us to a number of other well-regarded investors (thanks, guys!). That’s been a pretty typical experience in Silicon Valley over the past couple of decades. When someone wants to raise money, they reach investors through trusted contacts. When one investor signs on, she then introduces the entrepreneur to other investors she knows well. These introductions can have a strong weight, especially when the initial investor is a trusted source. This often works pretty well, but it means that companies often raise money from just a small number of highly connected cliques. That has positive implications — those involved likely have more trust in one another — but it also leads to a process that’s relatively closed. Investors often form clusters and invest together. So if, for instance, Mike sits in one cluster and Naval and Jeff are in another, it’s likely that many of our future investors will also hail from one of those two clusters. To understand this story quantitatively, I looked at angels’ co-investment patterns, using AngelList’s investment data to group the most prolific investors into clusters. I put the top 870 investors into 25 distinct clusters. Each cluster represents a group of people from whom co-investments are more common, for any of a number of reasons — geographic, industry-based, philosophical, or reputational. So do the clusters reflect real investor patterns? To answer this, we can compare to a “random” world, where investors find startups and make decisions on their own, without any social input. 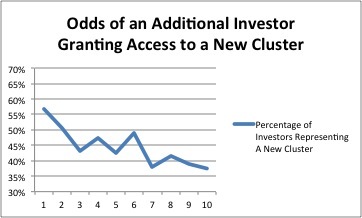 In this random world, the second investor in a startup would sit in a different cluster from the first investor 82% of the time. But the real world is very different from that. In fact, when a second investor comes on board, there’s a 57% chance that he’ll fall into a different cluster from the first investor. In other words, in the real world, investor #2 is almost 2.5x as likely to fall in the same cluster (18% vs. 43%) as in random world. This trend continues as the number of investment grows. When the existing pool of capital comes from two, three, or four distinct clusters, the odds that the next investor comes from one a new cluster is 47%. If it comes from five to eight of the 25 clusters, the odds go to 43%. All of these are considerably lower than one would expect in a random world: the universe of traditional angel investment is well-networked and influential upon itself (perjoratively: an old boys club). Enter AngelList, which is increasingly important in the startup ecosystem (disclosure: I’m an adviser). AngelList functions much more like an open marketplace for startups than the traditional model. In most cases, startups make public to all investors that they are seeking investment, effectively widening their pool of potential investors. So does this actually change the makeup of a startup’s investors? There’s a simple way to test whether AngelList is truly opening up funding (and investing) opportunities. If it is, founder-investor connections that come via AngelList should lead to more cluster diversity than those that come through other channels. 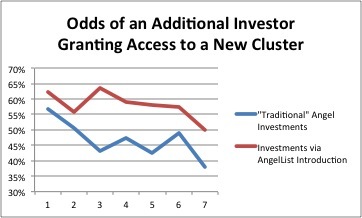 When two or more clusters are already represented, investments via AngelList introductions are about 30% more likely to yield a relationship with a new cluster than their non-AngelList equivalents. The numbers for AngelList intro investors are still a long way from the “random” equivalents — location, reputation of other investors, sector, and other factors matter on AngelList too — but they’re clearly indicative of a big shift. 1) They make the world more social, allowing us to see what our friends do and like. Basically, Facebook. 2) They make the world more efficient, by giving people access to information and markets. Basically, Google. AngelList sits in between those extremes. On the friends side, its follower model means that much of what people see is from the people they already know or at least know of. But on the information side, it opens up something that was almost entirely governed by word of mouth, and creates something that at least takes a big step toward being a marketplace. I don’t pretend to know enough about the macro dynamics of investor management to predict how this will affect company operations. But the effect on the investor pool is clear. As AngelList and crowdsourcing grow, the impact of the old boys’ clubs will shrink. For companies, the pool of investors is growing. I think I know how it feels to be a nagging dentist. I spend lots of time helping startup founders figure out how to increase the number of people using their product. Sometimes, founders think that because a few silly folks labelled me with the (soon-to-be-cliched) title of growth hacker, I am “magical” like an Apple product. With one quick suggestion from me, they can get to a million users! Unfortunately, it doesn’t usually work that way. Instead, I tell them, they need to (among other things) rigorously A/B test a dozen interface changes on their three or four most important pages. And then I get that “what-do-you-mean-I-need-to-floss-every-single-night?” kind of look. So… I need to tell you why A/B testing is like yummy candy. Fortunately, I can make that argument without being misleading: running A/B tests can be really fun and addictive (like Skittles!). You’ve probably experienced an eager expectation that something new would immediately improve your world in a significant way. Maybe as part of a website — a new, beautiful signup flow will mean a super engaged user base — or, in your personal life: a new hairstyle will encourage people to respond to you in a better way. A/B testing can provide that spark of hope on a very frequent basis: at Circle of Moms we’d have dozens of tests running at any given time, each serving as a quantitatively sound way to understand our usage and improve our product. Pushing out new tests multiple times a week, getting rapid feedback on each, is like regularly handing out chocolate to your team. Each test is a yummy morsel of hope: it has the potential to bring users in, excite and engage existing users, and make money. Frequent testing is like frequent chocolate consumption. Yum! Frequent chocolate consumption has risks, and so does frequent A/B testing. With A/B testing, it’s important to be holistic and patient about collecting data. But a product development strategy involving A/B testing is generally both more fun and more effective than the alternative “change and pray” approach. Now that we’ve established that A/B testing is fun, we get to the real questions. Why does it actually matter to your business? What should you be testing? When does it make sense to do? (brief answer: not always) And how, technically, should you do it? Let’s tackle each of those. The reason to A/B test is simple: because newer doesn’t always mean better, and everyone I’ve met is mediocre at predicting how effective a new experience will be. There’s often an implicit assumption that ______ in my product isn’t very good, and by spending time on it, we can only make better. In extreme cases — the current version is a 404 page not found error — that’s very likely to be true. But in more common cases — the signup flow is a little bit ugly and awkward — product changes don’t always mean progress. We saw this time and again at Circle of Moms. We had a new homepage that looked cleaner and more usable… and users who saw it stopped contributing to conversations. We had a signup flow that seemed much simpler and more professional… but fewer people got through it and those who got through it didn’t invite their friends to join our site. Surely asking people to share their answers on Facebook would be good, right? Turns out no: very few moms actually shared their activity, while many others were scared off by the thought of us making content too public (this only applied for some content types). Okay, you say, that’s all fair and well, but how about just making a change and seeing how it affects overall metrics for the product? There is a case where this is a good approach, and I’ll walk through it in the “When” section. But most of the time, it’s the wrong way to go. To work, serial “testing” requires three things: the rest of the world staying steady, large changes, and a close eye on metrics. Let’s say you’re looking at how a new homepage design affects activity, and all of a sudden your sending email IP is blacklisted by Yahoo. Your numbers will almost certainly go down, regardless of the effectiveness of your new homepage. New signup flow, and all of a sudden you get a surge of search traffic that broadens your audience but decreases the quality? Same type of issue. Major site downtime or technical issues can have the same impact. If you have a huge increase or decrease, and you know that the outside world is more or less the same over the test period, and you measure different cohorts properly, and of course you only measure one things at a time… serial testing can work. If you really think those can happen consistently, you’re a lot more optimistic than I am. 1) You have a product enhancement that might improve your metrics at a level material to your business, and want to try it. 2) You have a radically revamped piece of your product, and want to verify that it’s at least as effective as the current version. Generally, #1 is about iteration and optimization, while #2 is about design and vision. The thought processes for the two are very different. Viral signup flows. If your current signup flow features 1000 signups inviting 3000 people, 900 of whom register for your product, you’re very close to being viral (K=0.9). A/B testing would be a good use of time. If your current flow features 1000 signups inviting 600 people, 80 of whom join (K=0.08), then you aren’t in the ballpark: optimizing button text is likely a waste of time. Go bigger. Email content. Subject lines and link text can have a huge impact on email clickthrough rates. One typical example: an email with the subject “5 Embarrassing Kid Moments” gets 2.5 times as many clicks as one with the subject “The Craziest Thing My Child Has Done.” But again, being close to “good” is key: if that 2.5x is the difference between 50 clicks a week and 125 clicks a week, does it matter? If it doesn’t matter (and good estimation is key), no point spending time A/B testing it. Purchase funnel. Much of Team Rankings‘ revenue comes from subscriptions, and some purchase funnels can be much more effective than others. Last year, for instance, our March Madness product, BracketBrains, generated 30% more sales when we prompted people to “Get 2011 Picks” than to “Get BracketBrains”. Same caveats apply here, though: test if and only if the differences are likely to matter for your business. If you thought flossing was exciting, wait until he starts talking about statistical significance! The most important type of significance in assessing when to A/B test isn’t statistical significance, it’s business significance. Can a new version of this page make a real difference to our business? Size of user base, development team, and revenues inform what’s useful for different companies. Facebook can move the needle with hundreds of 0.1% improvements. A small startup with no revenue and 100 users doesn’t care about 0.1%, nor will they be able to detect it. In a small product with no usage, serial testing is fine: there’s no chance that the business will be built around the existing product, so rapid change is more important than scientific understanding. Statistical significance is the second most important variable in assessing when to A/B test. Making a decision between two options without enough data can undermine the entire point of A/B testing. Doing statistical significance properly can be difficult, but the 80-20 solution is pretty simple. Just use an online split test calculator, using estimates of statistics to see whether you are likely to attain statistical significance for a single output variable. A big caveat: a little common sense regarding statistical significance can go a long way. If you’ve been running a test for a while and don’t have a clear winner but have some other ideas that might move the needle a lot more, you might be well-served by resolving the test now and trying something new. You’re running a company, not trying to publish in an academic journal. At Team Rankings, we regularly do this with BracketBrains. Most of our sales happen over a four day period, so we have a limited window in which to test things. The “cost” of resolving slightly sub-optimally — say choosing the 5% option rather than the 5.1% option — is likely to be lower than the opportunity cost of not running an additional test. And since resolving a test when 99% of sales have occurred does us no good, we’re more aggressive than traditional statistical tests would dictate. If, on the other hand, you’re early in a product’s lifetime, conservative decision-making might be more appropriate. There’s one way to A/B test properly: build your own system. Lots of people probably don’t want to hear that, but products like Optimizely are too simplistic and optimization-focused to be broadly useful. Outsourcing your A/B testing is like outsourcing your relationship with your users: you need to understand how people are using your product, and the A/B testing services currently available don’t cut it. I wish I could recommend an open source A/B testing framework to avoid re-inventing the wheel; ping me if you know of a good one or are creating one (if so, I’d be happy to help). A/Bingo is the closest. I’m assuming you have a USER_ACTIVITY table that records different types of activity, with user, time, and activity type. A table like that makes A/B test reporting a whole lot easier. If your site is or becomes massive, scaling the framework will entail some additional work. USER_AB_TEST_OPTIONS may require a large number of writes, and that little query joining USER_ACTIVITY and USER_AB_TEST_OPTIONS might take a while. Writing to the table in batch, using a separate tracking database, and/or using non-SQL options may all help to scale everything. At Circle of Moms, we built out a system to automatically report lots of stats for every test. This was awesome, but it takes some work to scale, and I would never recommend it as a first step. As I said, A/B testing is like candy: fun and sometimes addictive. Done correctly, it can be part of the best form of mature and thoughtful product development. It builds a culture of testing and measuring. It lets you understand what works and what doesn’t. It forces you to get smarter about what actually moves metrics. Most important, it fosters an environment where data trumps opinions… anyone want to volunteer to try to take that to D.C.?